Millions of Americans are texting and calling while driving, and they're probably lying about it, according to new data by RealNetworks first obtained by CNBC. Women calling men are the most likely culprits for an accident. And it doesn't matter if it's moms calling their sons, wives calling their husbands, or mistresses calling their lovers. Men picking up calls from women while driving are much more likely to happen than the opposite. RealNetworks on Wednesday is releasing a new version of its ringback phone app LISTEN, which will now sense when the user is driving, and automatically let callers and texters know that their intended recipient is behind the wheel. When it comes to gender differences, look to men as the biggest culprits of bad in-car behavior—but mainly when women are the ones calling. 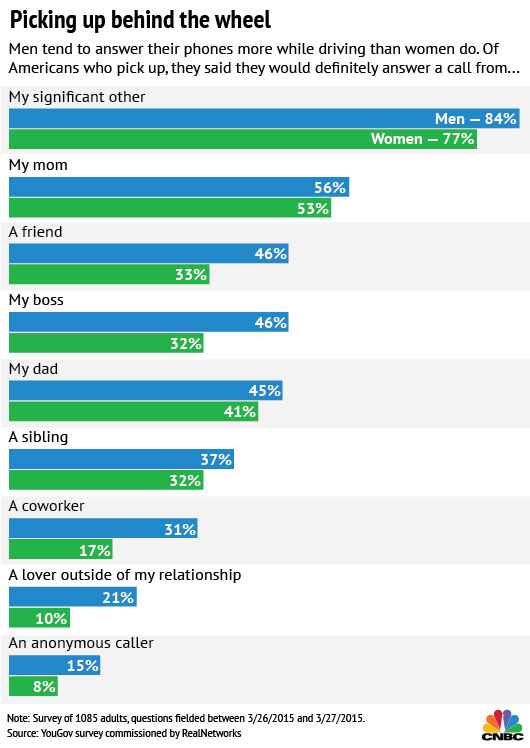 When answering a call from their significant other, 48 percent of men will pick up, but only 39 percent of women. Calls from mom matter more than calls from dad. The survey showed that when mom calls in, the driver definitely answers 29 percent of the time, but dad's calls only get a 23 percent pickup. The data is another strike against male drivers, who account for more than twice as many crash deaths as their female counterparts each year. Part of that is because men tend to drive more and engage in risky driving behavior, according to the Insurance Institute for Highway Safety, and it turns out that men's phone habits are just as bad. Drivers aged 18 to 34 are twice as likely to send a text while driving versus the national average (40 percent vs 22 percent). Max Pellegrini, president of product and marketing of RealNetworks, commented "we all know using your phone while driving is dangerous, and millennials are the most at risk." One in ten drivers aged 18 to 34 have taken a selfie while driving. Read that again. Have taken a selfie while driving. One in 10 drivers aged 18 to 34, have posted to a social media profile while driving. Twenty-two percent have checked a social media account while driving. It's one thing to run a survey and ask somebody if they text and drive. In that case, only 30 percent of Americans will admit to it. It's then another thing to ask passengers if they've sat with a driver who texted. Then the number nearly doubles to 53 percent. So that leaves a gap of 23 percent of American drivers—or more than 50 million people—are not only texting, but possibly lying about it. To be fair, it's possible that people's memories don't match up properly, or that many passengers are referring to a smaller group of texting drivers, and the survey's methodology questioned people across different time frames. But the number gap is so wide that it's clear some people are lying. Remember these numbers aren't just small percentages, but reflect millions of people across the country. This is one of the reasons why we will continue to see the push for apps like LISTEN, that prevent drivers from being so easily distracted. And why the longer-term development of self-driving cars will be on the forefront of the modern-day auto industry. When that comes to fruition, everybody can text their friends, post to Instagram, take calls from their moms and mistresses, and not feel the need to lie about it.